Opened in 1993, La Envia Golf Club is a desert oasis which was designed by Francisco Mendoza Montero. Located on a lake in a valley, between mountains and protected from the winds, the situation creates optimum conditions for golf. Over 5700m from the white tees, there are numerous bunkers and lakes which act as hazards. Palm trees, mimosa trees, agaves and many indigenous shrubs line each of the 18 holes, which are laid out in a irregular profile. 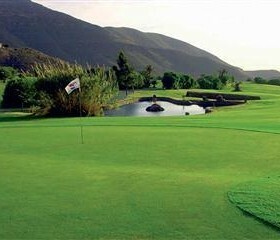 The golf course is 15 minutes from Almeria. Handicaps: maximum 36. Players must have golf insurance and handicap certificates. Insurance available from the Golf Shop.